Turn this bread mix recipe into a gift thats great for the holiday's. Combine all ingredients, except pumpkin, in large bowl. Pour into 1-quart resealable plastic bag. Place in fabric bag. 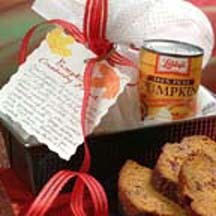 Place bread mix and can of pumpkin in 9x5x3-inch loaf pan. RECIPE TO ATTACH: Beat together 3/4 cup LIBBY'S 100% Pure Pumpkin, 1/2 cup vegetable oil, 2 large eggs and 1/4 cup orange juice or water in large mixer bowl until blended. Add contents of bag; stir until just moistened. Spoon batter into greased and floured 9x5x3-inch loaf pan. Bake in preheated 350° F. oven for 60 to 65 minutes or until wooden pick inserted in center comes out clean. Cool in pan for 10 minutes; remove to wire rack to cool completely. Makes 1 loaf.